Garcia is renowned for his roles in successful cases against corrupt politicians in Atlantic City, New Jersey; corrupt police officers in the Hollywood Police Department, the Boston Police Department, and in the San Juan, Puerto Rico Police Department. He has also worked undercover against hundreds of drug dealers and leaders of both Colombian and Mexican drug cartels, while posing as either a money launderer, transporter or trafficker. He has done undercover work on National and International terrorism cases as well as National Security investigations. Garcia has also worked undercover against Russian and Asian organized crime groups. Most remarkably, Garcia worked on many of these cases simultaneously, as he juggled his various undercover identities and roles. 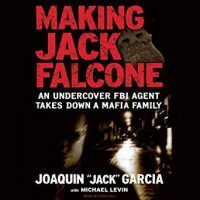 Garcia successfully managed to work as an undercover FBI special agent for 24 out of his 26 years of service without detection. Unfortunately, the project has been tossed around in Hollywood for ten years, and is still listed on IMDb as “under development.” Part of the problem might be finding an actor big enough to play Garcia. I don’t mean just a star whose name is well-known, but literally large — while on the job, Garcia weighed over 350 pounds, a number that would be too daunting even for Christian Bale. At one point, Benicio Del Toro was signed to play Garcia, with Steven Soderbergh set to produce or direct, but that fell apart. Garcia did get a “60 Minutes” piece and some other publicity when the book was published in 2008 and, lately, there’s been some buzz about getting the movie on its feet — if only they can find an enormous actor to play the role and fill those XXXL shoes.